This battleship measures 20″ x 4.5″ and is one of the largest ships that Keystone produced. The ship is missing the very top of the mast but I placed a small pin there to attach the flag line to. The line on this ship is interesting in that it is not just a string tied to the ship. It is a loop that goes through a small brass pulley so that the flags can be raised and lowered. i found one at a flea mkt yesterday, been lovingly used and missing the mast but wondering the value of it. With a few missing parts and depending on the overall condition it can run in the $75 to $100 range. I have seen them sell as low as $50 if they are rough. 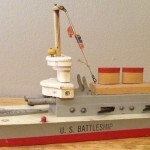 just interested if you would like to buy my battleship i purchased this weekend. Thanks for the offer but I have one and would only be interested if were an ungrade from what I currently have.